The fastest maggies appeal in Scotland, raising over £3million in less than three years. One in three Scots will be affected by cancer at some stage in their lives. This sobering statistic explains why Monty’s Maggie’s Appeal was a cause so close to our hearts. 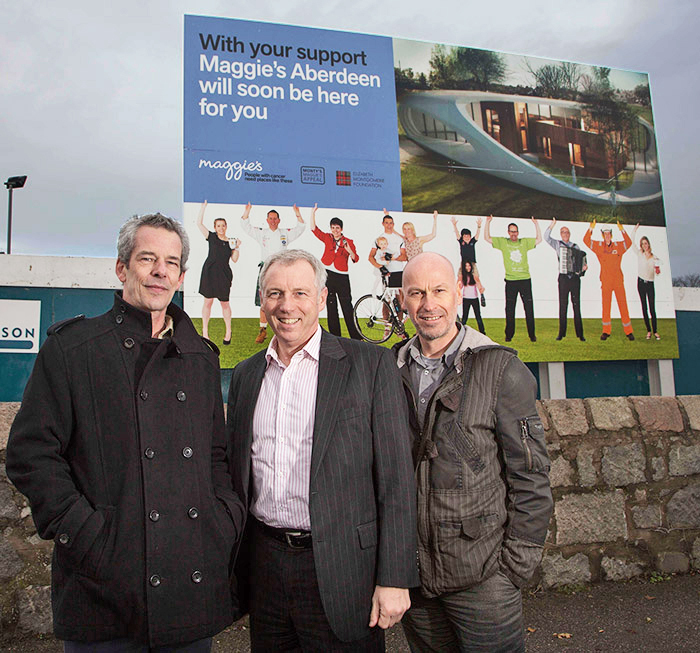 When Maggie’s launched an appeal to build a cancer-caring centre in the grounds of Aberdeen’s Foresterhill Hospital in 2010, success was by no means guaranteed. Against a difficult economic backdrop, £3million was identified as the amount required for the project. With 23,000 charities registered in Scotland alone, the battle for the nation’s cash was fierce. Yet Monty’s Maggie’s Appeal raised its £3million target in just three years, making it the quickest fundraising effort ever seen by Maggie’s in the UK. Undoubtedly much of this success was due to the strength of the cause. The campaign’s close connection to much-loved golfer Colin Montgomerie also provided a distinct advantage. But we’re proud to say that much of the appeal’s impact was down to the efforts of Fifth Ring. Our branding and communications expertise helped keep it front-of-mind for thousands of local people and hundreds of businesses over the extended campaign period. With such extensive coverage spanning three years, it was crucial to keep content fresh to avoid reaching ‘saturation’. Too much repetition would have resulted in a loss of impact. We managed to overcome this using creative solutions that captured the imaginations of the general public. "I have been overwhelmed by the support from donors in Grampian. Fifth Ring has been our marketing and PR partner from the outset and have provided valuable advice that has greatly boosted the profile of the Monty’s Maggie’s Appeal. The awareness and the ongoing publicity we receive has ensured the appeal is constantly in the public consciousness and as a result I am certain that Maggie’s at the Elizabeth Montgomerie Building will become a reality sooner than anyone expected." "We approached Fifth Ring because of its reputation as the leading business-to-business integrated agency in Scotland and for its unrivalled reputation in the north of Scotland as experts in delivering effective marketing campaigns that deliver results. The fact they have achieved everything we have asked them to do and surpassed our expectations has made a significant contribution to the success so far of the appeal." "I can’t emphasise enough the importance of the service and support that Fifth Ring has provided the Monty’s Maggie’s Appeal with. Despite executing all of our design, PR and advice requests free of charge they have consistently treated us as a priority client and delivered work to the very highest standards. We very much feel that the whole team at Fifth Ring is behind us and understand that we need to maintain a high-profile appeal in a very competitive environment. Our appeal income has exceeded all expectations." The appeal went on to win Best Campaign at the Northern Star Business Awards, Gold for pro bono work at the Hermes Creative Awards and silver for a charity campaign at the Marketing Society Star Awards.